The Museum of Art, Architecture and Technology (MAAT) is a new exhibition space created for EDP, a Portuguese foundation in Lisbon. The building opened in October of 2016 and just created its first curated exhibition. I had an opportunity to visit its exhibit Utopia/Dystopia: A Paradigm Shift in Art and Architecture and it provided an opportunity to see how the new structure functions and is being programmed. Designed by British architect Amanda Levete's firm AL_A, The MAAT operates as a ‘Kunsthalle,’ with no permanent collection of artifacts, but as a space to promote and stage cross-cultural or interdisciplinary experimentation. The building has several functional exhibition galleries, but its focus is an enormous, 13,000-square-foot, centralized elliptical space, ringed with steep inclined viewing ramps made for theatrical performances and temporary installations. The ramps are meant as viewing platforms but the steepness of the slope propels viewers down and then up and around the central ellipse. This constant movement by viewers can allow them—if curated properly—to be part of the action or to become the event itself. It's an interactive public space for an age more familiar with digital and VR images on a screen than in a physical gallery. The low, long profile of The MAAT's exterior appears like a slightly opened oyster shell set in the mud along the facing Tagus river and estuary. If one imagines the shell opened ever so slightly, this is where Levete has placed the entrance into the building. Up a curving set of long, narrow steps, with a hovering deep overhang meant to capture the dappled reflection of the river, the public is pulled in a short entrance into the lobby and then into the grand open performance ellipse. Its facade is covered in 15,000 “crackle glazed three-dimensional” tiles that give it a fish scale like dimension on the cityscape and honors the city’s many tiled facades. When these ceramic rectangles catch beams of natural dappled or artificial light the building magically glows like a light bulb. But it is not simply the facade of the building that comes alive through refraction. This is a building meant to perform on every surface. It is, in some ways, as much landscape as it is an enclosure and thus a structure meant to perform. The term ‘performative architecture’ stands for several older and newer ideas in architecture and the design of urban public space. If by the term one means buildings created to encourage active public engagement and themselves actively participate like Roman baroque urban experiments or even worlds fairs, then Levete’s building is an unqualified success. It becomes a pedestrian promenade and visitors areg meant to walk along, onto, or over its tiled sloping roofscape like Foreign Office Architect’s 2003 Yokohama terminal. Last week's opening programmed performances to take place on every surface of the structure. It started with a musician ‘playing’ the ceramic tile facade with a vibraphonist's soft mallets and group of musicians dancing and singing on the top step of the covered front entry platform. The central oval space featured an opening night performance by Mexican artist Hector Zamora that featured crews of migrant laborers destroying a fleet of old unusable (but beautiful) fishing boats as a protest against the disappearance of a way of life represented by the small craft. The highlight of the first-day performance featured O Terceiro Paraiso, choreographed by Italian Michelangelo Pistoletto on the sloping roofscape public space. The Italian arte povera and ‘action’ artist theorized a potential new utopia—in accordance with the exhibition opening in the galleries downstairs—that asked several hundred participants to hold hands in three labyrinths made of a single line that would create a new third utopia from the two earlier ones that he theorized as an everyday 'Gesamtkunstwerk.' The performance was pushed along by the large sloping facade of the roof that stands as an open space above the riverside promenade and facing back to the city in the distance. It should be pointed out that the Levete renderings show the roofscape with a whiplash-like tail flying over the adjacent freeway to the roof of The MAAT. This freeway acts as a wall that cuts off Lisbon from its waterfront as if it were lifted out from any number of American cities. When (and if) this tail ramp is finished it will bring the city across the freeway and onto the roofscape and be the performative space the museums want to be for their home city. 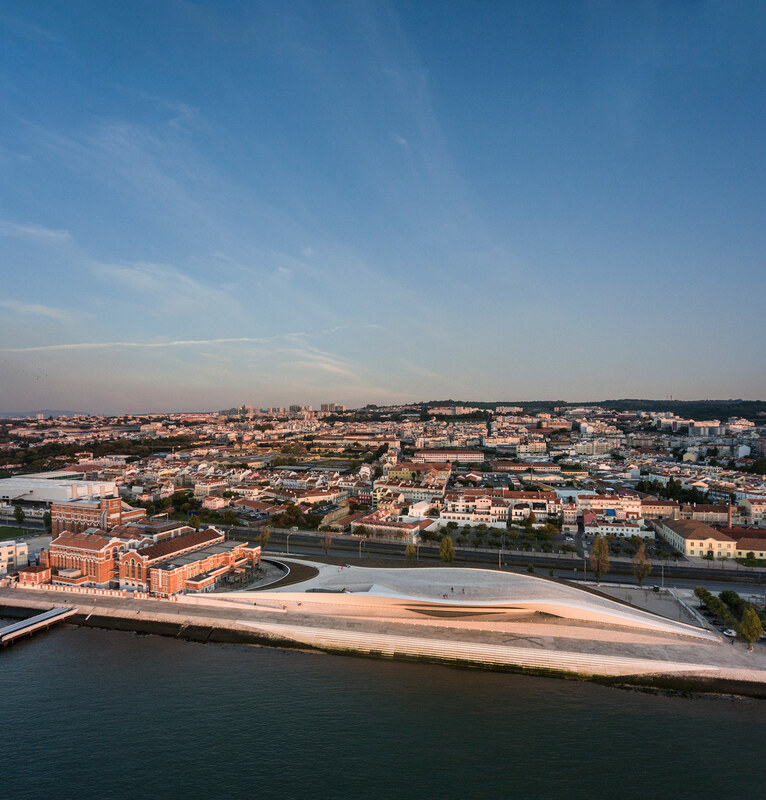 Levette has delivered a potentially valuable new focus and hub for the Portuguese capital but it remains for the MAAT director Pedro Gandhao and his curatorial staff to realize the spatial and performative qualities of the museum. They have the opportunity to make this one the most exciting venues in the world that programs architecture and technology alongside art. Next week is an exciting one for the architecture community in the Portuguese capital Lisbon. First, there will be an opening for the new Amanda Levete-designed Museum of Art, Architecture, and Technology (MAAT) and the city will host The Form of Form, its fourth architecture triennale. The museum is located in the district of Belem, a beautiful site, on the city’s city waterfront and adjacent to the recently renovated Central Tejo power station. 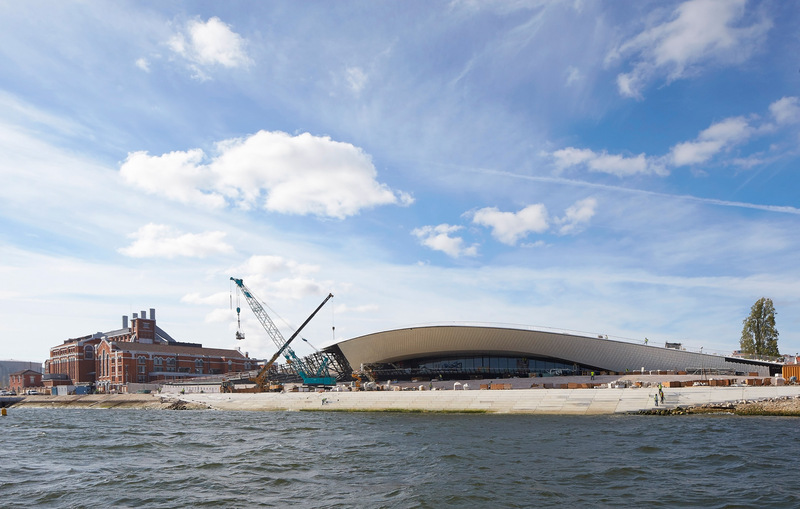 The MAAT and power station will form a cultural campus. The new museum, directed by former MoMA curator Pedro Gadanho, will act as a kunsthalle (not a collection of objects or archives, but a generator of new projects and exhibitions). The MAAT will focus on contemporary culture through visual arts, new media, architecture, technology, and science. Levete's design will allow visitors to walk over and under the building. The Triennale will open on Wednesday, October 5 and take place in nearly a dozen sites around the city. The Architect's Newspaper will be there covering all the events and openings. 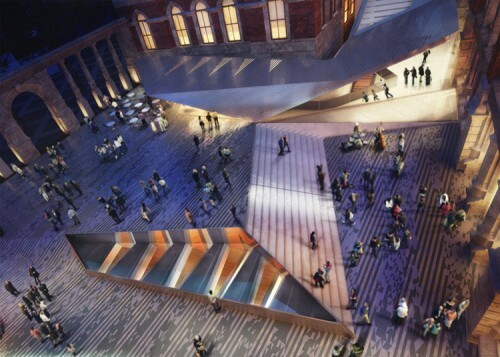 When Libeskind’s radical spiral proposal for Victoria and Albert Museum (V+A) extension went under after eight years, the V+A has literally gone underground. The newest proposal for V+A by British architect Amanda Levete and her practice AL_A, won in 2011 after a design competition, calls for an extension project that includes a 16,200 square foot underground gallery space for temporary exhibitions. The addition will feature a public courtyard with an entrance into the museum from the adjacent Exhibition Road. Last week, the project was awarded planning permission allowing the project to move forward. In 2006, Libeskind’s proposal called the Spiral featured a building that resembled unevenly stacked boxes, but after being denied public funding several times, the project was never built. Compared to the Spiral’s $160 million estimated cost, Levete’s comparatively modest $64 million design appealed to many, including of course, the V+A. 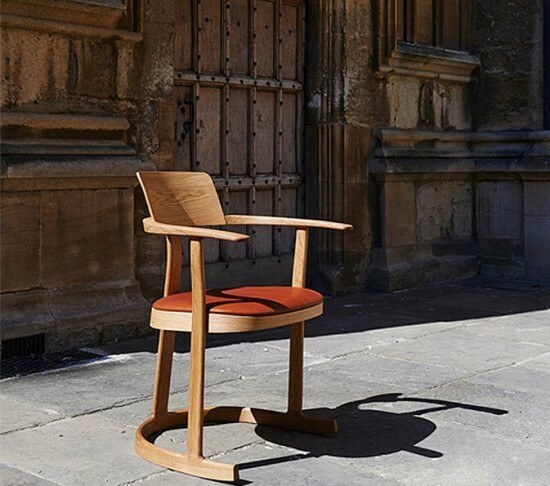 Despite the more affordable price tag, Levete's design does not lack aesthetics. The descent into the gallery is adorned with dramatic pools of natural light provided by geometric skylights cut into the plaza. 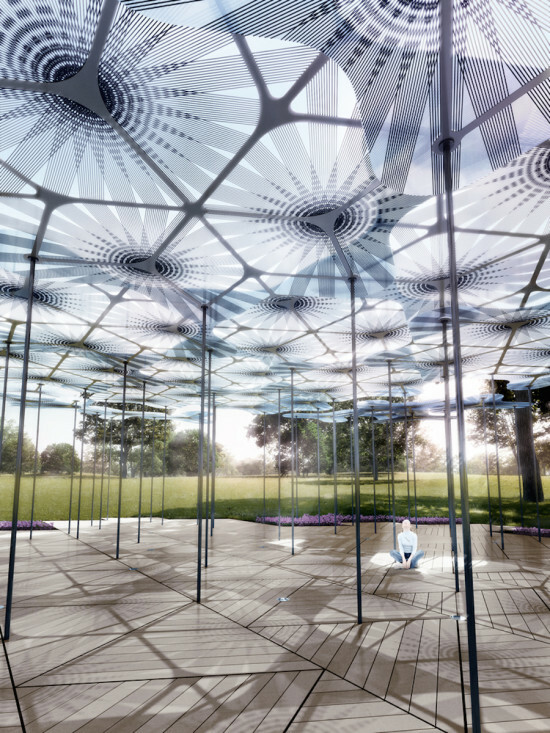 The shape of the skylights will be visible above ground from the courtyard, allowing visitors to view the gallery beneath their feet. A folded-plate structural ceiling reveals a modern take on the neo-Gothic and neo-Classical tradition of ornate ceilings. The concept of descent and ascent with manipulation of light will allow the visitors to focus on the interplay between new and old. The courtyard will be bordered by architecturally significant facades, including the museum’s Victorian walls that have been restored but yet to be on public view. Levete hopes that opening the courtyard will create a new dialogue and fluid circulation between the street and the gallery. Now with a feasible building plan in hand and nearly $40 million in the bank, V+A hopes to begin construction on the new underground facility in 2013 with an expected completion in 2016.